Since I have one more week before I start working in the real world, I am going to try to take advantage of the extra time to update this blog more frequently! This week's topic: summer and everything I love about it. 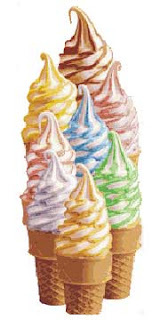 When I think about summers, the first place my mind goes is to ice cream. This is partially because it is a wonderful warm-weather treat, but also because in my hometown, getting ice cream with friends is just about the only evening activity available between May and August. The rest of the town closes down at about 8:30, and while sometimes there are outdoor concerts or events, ice cream is the only thing to count on. Plus it's delicious. There are three ice cream places that have defined my summers from childhood until now. Bedford Farms is a short drive from Lexington center, and I adore it primarily for its flavor burst soft serve. That's the type of ice cream that has the colored lines up the side of each swirl. Bedford Farms has a range of flavors in this style, including cotton candy (blue), butterscotch (golden), pistachio (green), and raspberry (pink). They also have great ice cream flavors, but since the flavor bursts are what make them different for me, that's what I stick to. After school in the spring my junior year of high school, some friends and I volunteered at one of the elementary school's science clubs. We had just enough time to run to Bedford Farms, devour some ice cream, and make it back for the 3:15 start of the program. Perfect. There are several Kimball's around Massachusetts, but the one I went to growing up is in Carlisle. Its defining feature is the massive amount of ice cream you get, no matter what size you order. I can usually finish a kid's size, and sometimes a small, but even that's pushing it. When my uncle visited one summer, he ignored my family's warnings and ordered a large. He spent a good portion of the afternoon trying to get strangers to eat some of his extra ice cream. The ice cream is delicious, and they have dozens of flavors. It's also on a farm, so while you enjoy some Butter Pecan in a cone, you can watch chickens and goats. They're also open until 10, which is always a plus in suburbia. Rancatore's opened in Lexington when I was in high school. As far as I know, it is still the only ice cream shop in Lexington center. Ranc's staff tends to be primarily LHS students, and it was rare that I could walk in without recognizing someone. (One of the first signs I was growing up was when I returned to Lexington during a college break and didn't know anyone working at Ranc's. It was a weird feeling.) Ranc's has creative ice cream flavors - my favorite has always been Gingersnap Molasses - and wonderful frappes. (Also, the fact that I can go in an order a frappe rather than a milkshake makes me feel like I'm at home again. I really missed the east coast when I was in Michigan.) Rancatore's is also the only place I know of in Lexington that is open until 11 pm, making it a go-to hang out spot for anyone who wants to be out of the house after 9. There are tons of other great ice cream places around Massachusetts, but these are the three that always pop into my head. Summer to me has always meant ice cream, and ice cream has always meant Bedford Farms, Kimball's and Ranc's. So far I've found one place in Philadelphia that compares, so maybe my summer ice cream repertoire will be expanding soon. Where are your favorite ice cream places in Massachusetts? In Ann Arbor? In Philly? 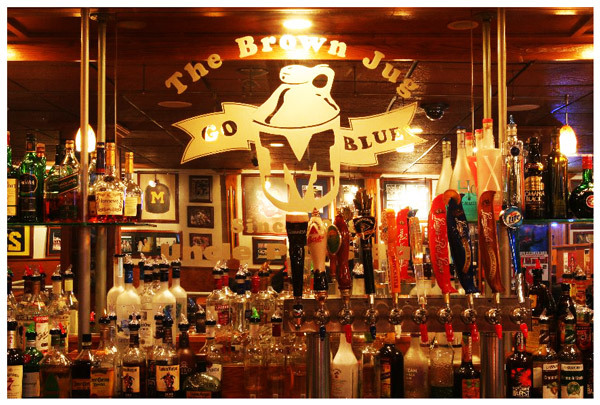 The Brown Jug on South University is one of my favorite bars in Ann Arbor. The drinks are great, the staff is so friendly, and it has a great atmosphere, even when it's a crowded Saturday night. It's covered with Michigan memorabilia, so it's a good place to go to watch games. I have a lot of great stories from the Brown Jug, but I'll just share a couple here. On my 22nd birthday, my boyfriend and roommates threw me an incredible surprise party that started at our house, then moved to the Jug. One of my roommates made everyone who attended wear pointy party hats out to the bar, and we had a wonderful night. As soon as we walked in, one of the bartenders I know started mixing up my favorite shot for everyone in our group. Later, the lights in the bar suddenly came up, the music stopped, and everyone started singing while my friend brought out a cake. It was an amazing night, many thanks to the Jug. So delicious and such a surprise! On Sunday nights the Jug has karaoke. Several of my friends are regulars, and I've got to say, they put on quite a show. From one pair's spot-on rendition of Macy Gray's "I Try" to others' impressive versions of Madonna's "Like a Prayer," there is some fantastic and hilarious singing every week. It's a fun night, filled with good drinks and friends. Since it's a Sunday, the bar is less crowded, at least until karaoke gets going. I have also been known to sing a song or two, though usually with friends - one night I was especially proud when several of us sang "Africa" by Toto. It's been several weeks since I moved out of Ann Arbor, and every Sunday night I feel a bit of a twinge, wishing I could be back there singing with my friends. Whether I go there for the waffle fries, the John Dalys, the good beer, or because I'm almost guaranteed to run into someone I know, the Brown Jug is a great place to be. It is absolutely one of the places I miss most in Ann Arbor. Do you have other favorite memories from the Jug? I have been living in Philadelphia for just about a week and so far have been enjoying my time in the city. Rather than think about how much I miss Ann Arbor, I'd like to share a new place I tried this weekend. My sister came over for dinner on Saturday night, and she told me about a crepe restaurant she'd tried recently. After she spent a while describing delectable, mouth-watering desserts, we decided to just go out and get some. The chocolate chip cookies I had in the apartment were not going to be satisfying after that conversation. 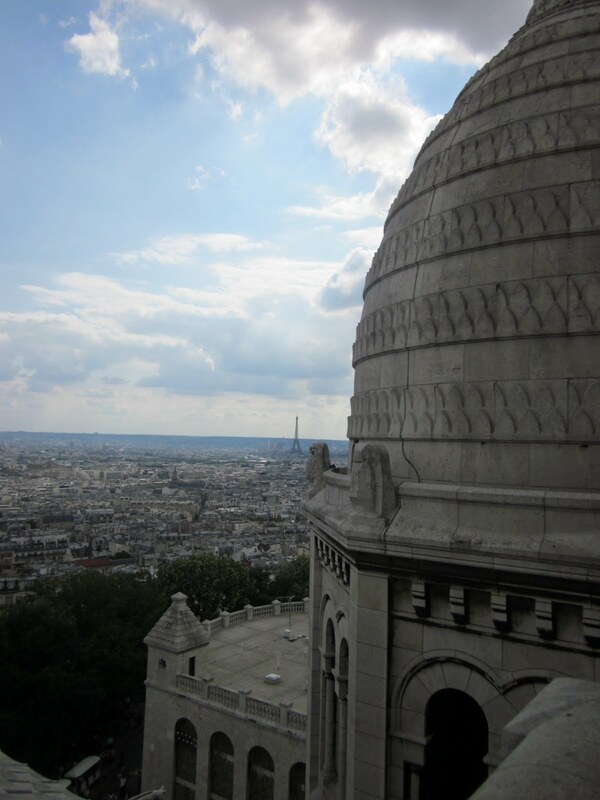 After a short bus ride and a few blocks' walk, we ended up at Beau Monde. It gave me two things I missed most about France - outdoor seating and Breton crepes. 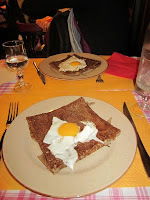 This was an egg, cheese and probably ham crepe in Rennes. Delicious! My sister and I each got sweet crepes. The fun thing about Beau Monde is that they give you a list of ingredients, and you pick whatever you'd like to add together for your dinner or dessert crepe. (They also have suggestions for if you're like me and get overwhelmed by choices.) The price varies based on what you add to your crepe. My sister tried cherry compote, chocolate and creme Anglaise, while I tried baked pears, chestnut cream and chocolate. Both were delicious, though I think next time I'd like to try something with more fruit and sorbet. The inside of the restaurant is elegant, and along the sidewalks outside they have a raised seating area with a thin iron railing surrounding it. We sat outside under a big yellow umbrella - I was so glad it was a nice night. 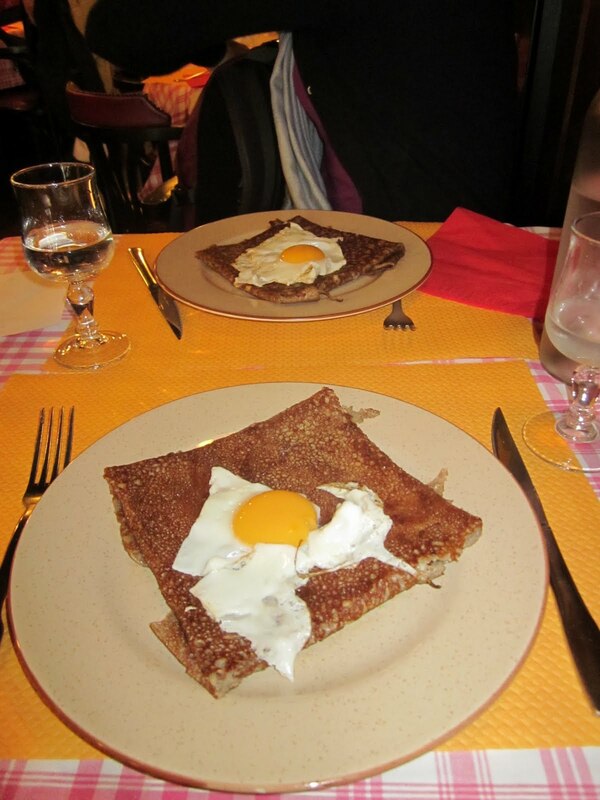 In the last week of my time in Nantes, I also went out for crepes several times with the two other girls from Michigan. We found one creperie in the Bouffay district that was wonderful and had a great outdoor patio. During that week we went at least three times. I also loved the cafe culture in France during the summer, where you can sit outside with a drink, watch people go by, and enjoy the weather. In Nantes' restaurant district almost all the streets were for pedestrians only, so sitting outside did not mean you'd have to talk over the sound of car engines or risk accidentally tripping a biker. But now back to Philly. Beau Monde's street was relatively quiet, so we could have a conversation easily. Also, because we were close to South Street where there are a lot of bars, we got to watch several bachelorette parties wander by. Sitting with my sister at Beau Monde and happily eating our crepes reminded me of last summer and how much I loved France. It was a great evening and I am definitely looking forward to spending more time exploring Philadelphia. Ashley's is a bar on State Street that I love. It has over sixty beers on tap and their menu is descriptive and helpful when you try to choose one. Ashley's was the first bar I went to on my 21st birthday, and it played a significant role in my post-21 year old life. From Friday afternoons to long conversation-filled evenings, Ashley's is one of my favorite places in Ann Arbor. Ashley's is the type of bar where people arrive with the intention of sitting and spending the evening there. You grab a table with some friends, order a round of beers, and catch up. The music is quieter than bars on South University so it's easier to have a good conversation. The beer is great - no matter what kinds you like, you can find them. I'm partial to Belgian-style ales and wheat ales. I've only been for dinner a few times and the entrees were tasty, and their late-night appetizers are delicious. Their pesto fries seem to be the best-known item for good reason. Waffle fries spread with a generous amount of pesto, served with an olive dipping sauce - wonderful with a cold beer and great to share with some friends. 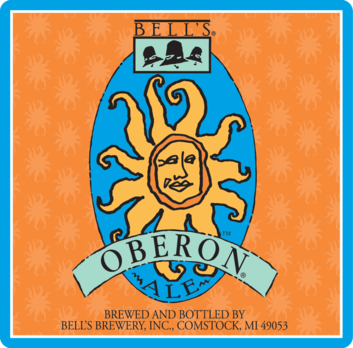 I have many stories about nights at Ashley's with friends: the night I learned that absinthe dropped in Red Bull is dangerous but surprisingly doesn't taste bad; the night I went to grab a quiet beer with a few friends only to discover that it was the Oberon Release Night and some woman was about to be crowed Oberon Queen (Bell's Oberon is brewed in Kalamazoo and is only available in the summer. It is amazing. ); the night my brother and his girlfriend were in town and I was finally old enough to take them out to a bar. One of the best ways to describe Ashley's, though, is through my Friday afternoons this year. On most Friday afternoons from 2-4 pm, I had my history thesis seminar. Unfortunately, that was the only time all of us were available to meet. In my experience, very few college students enjoy Friday afternoon classes. It's practically the weekend, you could be spending your time getting work done (or sleeping), you could leave to go home for the weekend, and so on and so forth. But alas, I had Friday afternoon class both semesters of senior year. While I did like my classmates and overall it was an interesting class, my attention span for discussions about historiography, for example, is really only so long on Fridays after 2:15. My friend Elaine came up with a fantastic solution: after class, we'd go to Ashley's. There was a group of us that would head out, each grab a beer (or soda or coffee) and sit and chat. It wasn't anything wild, just a nice, casual way to wind down after a long week and a long class. We'd chat about our theses and our lives, and I made some good friends those Friday afternoons. I looked forward to time at Ashley's every week. Even on weeks without class, we'd make an effort to carve out an hour at 4 pm to quickly sip a beer and talk. That, more than anything, is what I think of when I think about Ashley's. Yes, the range of beers is great and I love the pesto fries, but Ashley's is about grabbing a table with some friends and talking. That's something that I definitely miss now that I'm away from Ann Arbor. 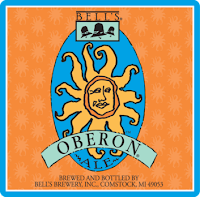 Well, that and Oberon. My friend Amol pointed out to me that I forgot to mention Ashley's Beer Tour card. If you ask, your server will give you a card that lists all of the bar's beers, including spaces for rotating taps. When you order new beers, they sign off on the card, and once you've tried a certain number you can get cool free stuff. For example, after five beers you can get a free appetizer. After 100, you get a personalized hooded sweatshirt. Not too shabby. My goal had been an Ashley's pint glass, which I would have achieved after 20 beers. (Please note: you can only get signed off for four beers any given evening, so they are not trying to encourage you to order an excessive amount of beer in one night.) Sadly, after getting signed off for seven over the course of several weeks, I left my card on the table one night. It was too close to graduation to have a reasonable chance of achieving 20 beers, so I abandoned that dream. Maybe someday I'll be back in Ann Arbor for a long enough stretch to earn a pair of pint glasses, and maybe some free cheddar ale fries on the way.